Tammy365: Do you suffer from "Hidden Identity"? Do you suffer from "Hidden Identity"? My favorite apple is a Stayman Winesap. I was happy to see this juicy, red specimen in a produce bin grocery shopping last Saturday. I picked it up, squeezed it a bit and my mouth watered. I thought about biting into the apple tasting the tartness at first and then the sweetness that balances every bite. I bagged the apple placing it in my cart; sold. Yesterday, I ate the apple...almost. Juice squirted on my knife as I cut. The crunching sound of the knife sliding through the apple skin was music to my ears. I can't stand a mellow apple. My taste buds swelled as I anticipated a delicious bite. My eyebrows furled and my mouth went dry when I saw the brown mushy stuff in its center. 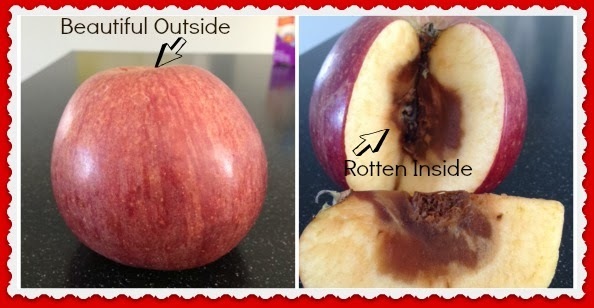 My apple was rotten inside! Disappointed, I ate cantaloupe thinking "How could something look so good outside but be so bad inside?" The store didn't know the apple was rotten. The only means to find out was to cut it or basically reveals its insides. This beautiful piece of fruit had a hidden identity. I fear many people are suffering from "hidden identity." The Bibles states in Proverbs 28:12-13 KJV "When righteous men do rejoice, there is great glory: but when the wicked rise, a man is hidden. He that covereth his sins shall not prosper: but whoso confesseth and forsaketh them shall have mercy." When we sin without confession and forgiveness, it creates a rotten spot in us. Our rotten spot can grow until our outside becomes as rotten as our inside. When we sin we may look like the apple, great on the outside, bad on the inside. Can you imagine what the apple would look like in about two weeks? Totally brown and rotten! We become more rotten the longer we continue to sin. Does one un-confessed sin really matter that much? You know the old adage "One bad apple spoils the whole basket." Let's just say "One un-confessed sin spoils the whole heart." An apple is Mother Nature. Sin is human nature. Confession and forsaking our sin to receive mercy is Godly nature.